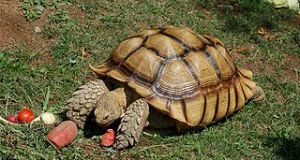 The responsive ways of North Africa’s massive Spurred Tortoise are well known to private and professional turtle keepers. Inquisitive and alert, these arid country natives are quick to become possessive of their territories and, sometimes, owners. They adjust rapidly to changes in their environments – two 80 pounders that I kept in a half-acre outdoor exhibit at NYC’s Prospect Park Zoo never ceased to amaze me, despite having been under my daily observation for years. A few years ago, my mother kept an abandoned 30-pound male free-ranging in her yard until a suitable home could be found for him. He was adopted by a friend, and in short order took over his yard – digging furiously to get at the dog next store, bullying the owner’s dog and ramming or ignoring anyone save his owner. He never failed to appear when his owner came home, and walked over to sit near him at every opportunity. In June of this year, a neighbor’s terrier-mix (an annoying, yappy beast, I might add!) got into the tortoise’s yard and, in true terrier fashion, made right for what looked like an easy target. 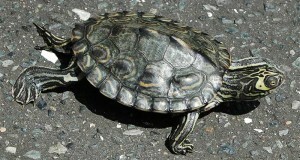 He managed to bite the tortoise’s front leg – at which point the leg was withdrawn into the shell. As you may know, Spurred Tortoises have thickly-scaled limbs and immense strength, and use their legs as a shield against predators. Evolving in a habitat with much larger and fiercer predators that a mere terrier, the tortoise easily pinned the animal between its massive foreleg and shell, and there it remained. Efforts by several strong men failed to straighten the tortoise’s leg and, in fact, seemed to strengthen his resolve. Water was poured on the animals, also to no avail. I was unable to get to the scene, and thought an injection of a muscle-relaxer might be required. However, I first suggested that the animals, being carefully supported, be submerged in a child’s wading pool. Thankfully, this did the trick and the tortoise released his wrestler’s “scissor lock”. Despite having been gnawed on for over an hour, the tortoise’s leg was unmarked. The terrier, I must say, seemed eager to do battle once again as soon as he cleared the water from his nose – but his owner had more sense!